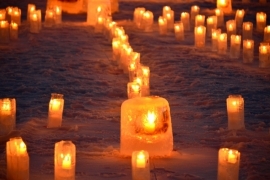 Urabandai Tourism Association is holding “An Eco-Night Fantasy- Urabandai Snow Festival,” where 3000 candles will light up the snow covered Renge-numa. On January 15th, there will be fireworks and then on January 16th, fireworks and a mini concert will take place. Also, the festival is looking for volunteers to help set up the candles in the snow. For more information, please contact the snow festival’s planning committee at 0241-32-2349.